I know that there are inaccuracies concerning the dates on this page. If you can supply corrections I would be glad to update the information listed below. 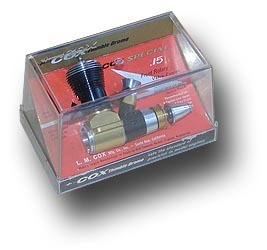 Similar to the boxes used for the car and aircraft models this box was made from a golden lower part with inserts and a gold embossed imprinted cover. 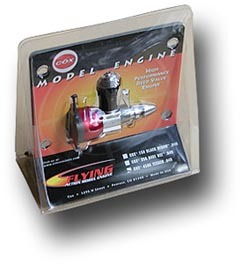 This type of packaging consists of a clear bubble canopy which slides over a red or yellow lower part with recesses for the engine and its accessories. An colorful inlay card was listing the the engine specs. 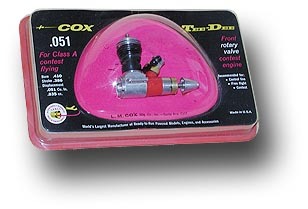 These packs were used in various sizes, depending on engine type. 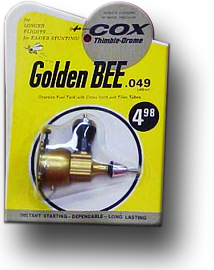 The bubble pack was protected by a cardboard sleeve in red, yellow or plain brown color. For the Tee Dee .051 shown here, an old stock sleeve of the Sportsman was reused by blackening out the Sportsman label and stamping the Tee Dee order number besides. Some of the mass produced standard and replacement engines were sold in blister packs. 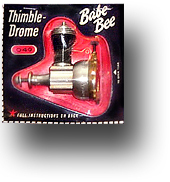 Usually a larger blister card held several engines of the same type so that the dealer could simply rip off what the customer needed (yes, a real rip off!). You can also see that how the design of the cards was more or less heavily modified every two years or so (Babe Bee 1959 in black and 1962 in red). 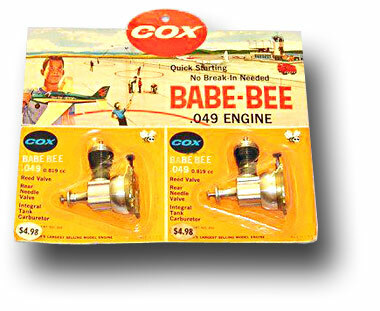 Typically each card contained 6 engines - the examples show a single engine or, in case of the Babe Bees at the bottom the two engine packs attached to the header strip. Four engines have already been torn off at the bottom of the card. 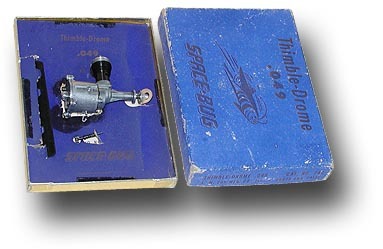 Following the individually designed bubble boxes these clear crystal boxes were used for several engine types and sizes. 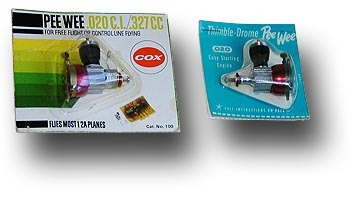 Depicted are boxes used for the Tee Dee and Medallion series (top) and a different box style as used for the Pee Wee and Bee engine models. The cardboard base provided space for the instruction sheets and accessories, while the upper part was a display card designed for each engine. 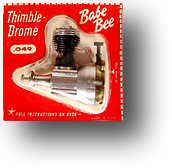 The Pee Wee and Bee engines were delivered without an extra instruction sheet - instructions and spare part list were printed directly on the bottom of the cardboard base. A plain cardboard sleeve protected the case against scratches and allowed for easy storing and stacking. This simple box was made of printed cardboard material. The engine type was printed on the inlay card so that it was also visible from the outside through a window at the rear. The box does not look as attractive and is not as durable as the crystal box, but was surely cheaper to produce than the previous boxes. With its lid open, it provided a fairly good shop display of the engine. This plastic container is made from a single piece, which is folded to form a base. 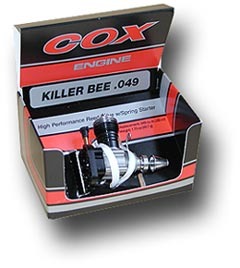 Compared to the simple cardboard box it provides a much more attractive presentation of the engine. 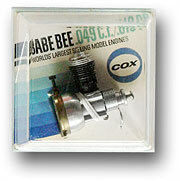 It was used up to circa 2005 for the newly assembled (from old stock parts) .049 Bee type engines (Babe Bee, Black Widow and Texaco) whereas old stock engines like the Tee Dees still come in the cardboard box.